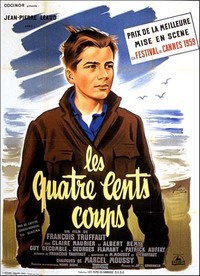 The 400 Blows is Francois Truffaut’s first feature film about a boy who is misunderstood by his parents causing him to leave them and enter into a life of crime. A powerful film set in Paris that gives a glimpse into Paris life of the 1950’s along with a Jazz soundtrack. The 400 Blows is a coming of age movie (Heh, get it?) about a young boy named Francois who tells his mother that he will receive 400 blow jobs before the Summer is out. A poignant tale that will make you laugh and cry.